Apart from St. Andrew’s Church, Perching Manor [Farmhouse] is the only Grade II* listed building in Fulking and Edburton. 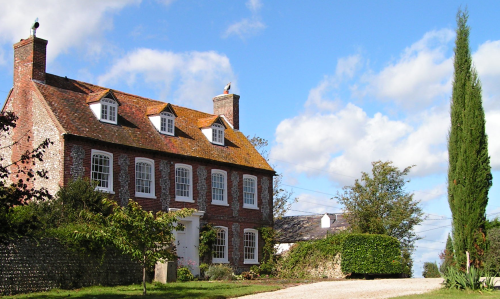 It is the eighteenth century farmhouse for Perching [Manor] Farm, and it retained its traditional role of providing a home for the farmer until 1984. 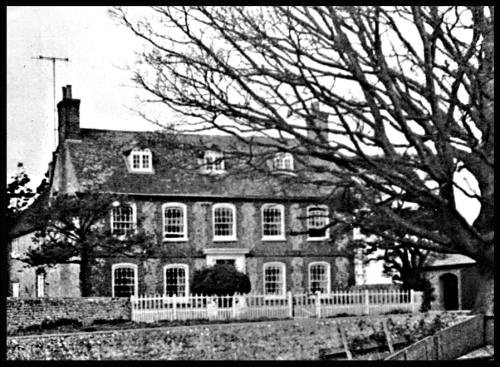 Modern official records typically refer to the house as ‘Perching Manor Farmhouse’, presumably to distinguish it from the original medieval manor house whose remains lie beneath a nearby field, but the house has been known to locals as ‘Perching Manor’ for well over a hundred years (the 1861 census lists it as ‘Perching House’ whilst the subsequent nineteenth century censuses have it as ‘Manor House Perching’). An L-shaped eighteenth century farmhouse, with Gothicized windows; two storeys and attic; five rooms wide; three dormers. Faced with square knapped flints with red brick window dressings, quoins, stringcourses, modillion eaves course and panels between the ground and first floor windows. Tiled roof. Windows with segmental heads and pointed Gothic glazing. The dormers contain casement windows and have artificial depressed heads which have Gothic panes in the sash windows below. Doorway with pilasters, projecting cornice, fanlight glazed with same pattern as the windows and door of six moulded panels. The front (east) elevation is of a different design to the back (west), which suggests that the front of the house was extended in the late eighteenth century. A beam, believed to be a chimney beam salvaged from the medieval manor house, is now located over the fireplace in the kitchen. The interior of the house has been modernised but, as can be seen from the illustrations above and below, the exterior has barely changed over the years for which we have a photographic record. In the 1990s, a separate building, which houses a swimming pool, was built in the north east corner of the property where once a rhubarb bed flourished. 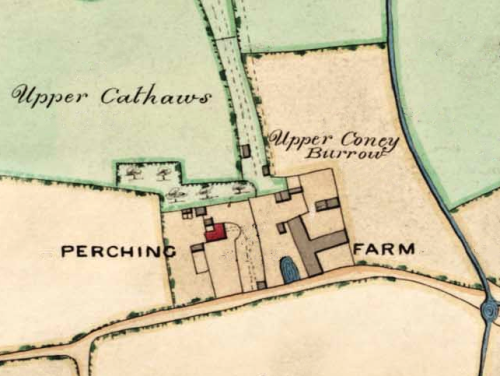 A map of the Perching Farm buildings in 1842, during Nathaniel Blaker’s tenancy. Perching Manor is marked in red. The physical layout is much the same today except that the farm buildings have been converted for residential use. The current farm and farmhouse is slightly further north. One of the jobs that came with being lord of the manor was that of ‘way warden’ — responsibility for the maintenance of the local roads. And with this job came controversy. In 1843, Nathaniel Blaker was summoned to court following a complaint from a Woodmancote resident that he was failing to maintain Holmbush Lane (now known as Bramlands Lane). He immediately called a ratepayer’s meeting at the Shepherd & Dog. The meeting decided that “the attempt to make the Hamlet of Fulking repair any part of the Holmbush Lane should be resisted”. It was resisted and, in due course, the matter was resolved in Fulking’s favour [Howe 1958, page 29]. The grave of Selina and Eli Page in the churchyard of St. Andrew’s, Edburton. 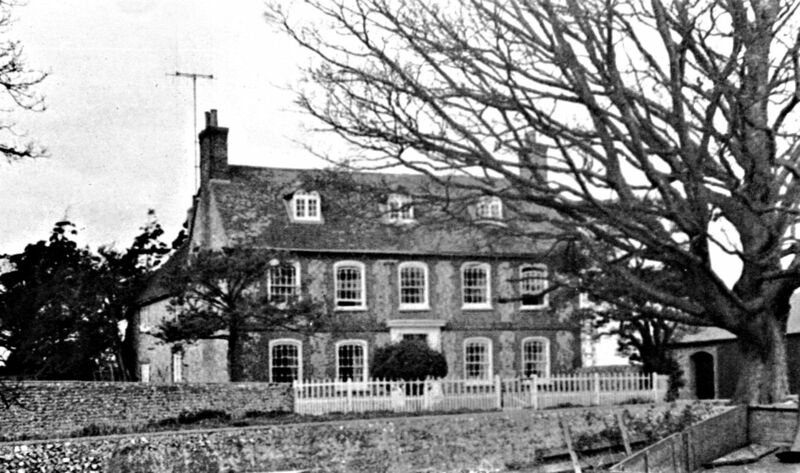 The Blakers left Perching Manor in 1856 or 1857 and Eli and Selina Page became the tenants of house and the farm. 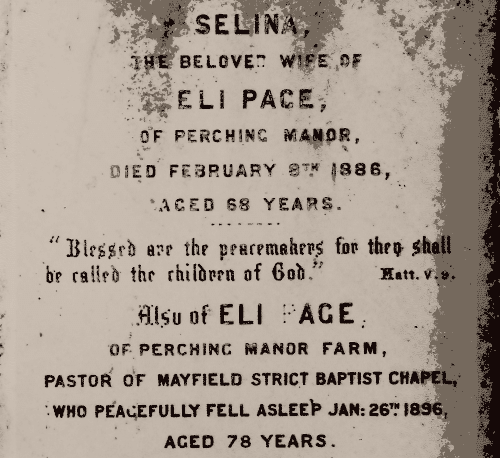 Eli Page is recorded as way warden in 1857. The Pages were in their late 30s at that time. The 1861 census records the family as consisting of four daughters, a son Richard, and Selina’s 80 year old widowed mother. No servants are listed. By 1871, Selina is listed as ‘farmer’ and head of family. The household then consists of three daughters, the youngest son Naphtali (Nap), who had been born at the farm in 1862, a granddaughter, a governess, a male domestic servant, and a visiting drapers assistant. Richard has married and is farming elsewhere in the parish. By 1881, the draper’s assistant, now listed as ‘draper’, has married Mary, one of the Page daughters, and is living at the manor with his wife and child. Selina is still the head of the household which comprises Nap (then 18), two other adult daughters, two other granddaughters, and a further child. There are no servants. Selina died in 1886, and by 1891, her family has left and Perching Manor is in the hands of Jemima Page, 62, living with a single female servant. Nap has married and is farming elsewhere in the parish. Jemima was not one of Selina’s daughters — she derived her surname through marriage to a Page. She does not appear in any of the earlier Edburton census records. She was, perhaps, a sister-in-law to Eli. Eli himself died in 1896. As pastor of the Mayfield Baptist chapel, he may have been living near there. In 1901, Nap Page took over running the estate. Nap was named after one of the twelve tribes of Israel [Naphtali], his father being a baptist minister. As a young man he was inclined to wildness, and was said to have ridden on horseback down Devil’s Dyke for a wager. He also rode regularly to his cousin John Page at Lodge Farm, Ringmer, for all-night card sessions. Rather than stick to the roads, he would go across the fields, jumping the hedges. Several photos survive of Nap. One shows him with a hen on his knee — this was Chuckles who was supposed to have laid an egg for Nap in his bedroom each morning. 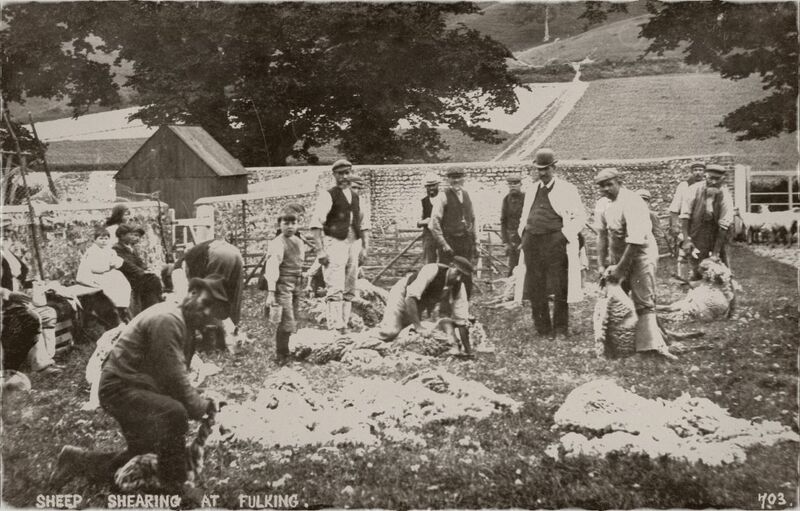 Another photo shows him in a long coat and bowler hat supervising the annual sheep shearing, sometime before 1912. A further photo shows Nap’s funeral procession leaving for Edburton church, with his favourite horse following behind the bier. As this quotation suggests, Nap adopted the role of country squire, becoming a keen huntsman and entertaining in a lavish style. Unfortunately, his interest in farming was minimal and by the time he died in 1920, the farm had become badly neglected. 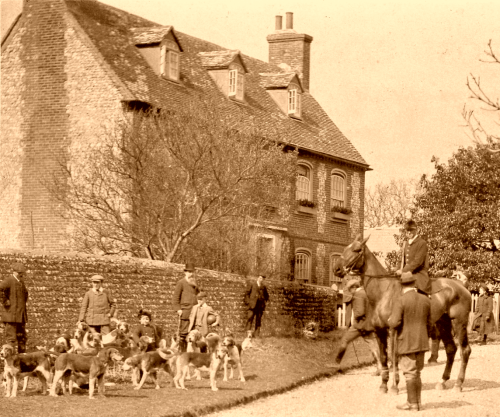 The South Down Foxhounds assembled outside Perching Manor in 1911 during the Nap Page tenancy. In 1920, Henry Harris, an experienced and well-respected farmer, took over the tenancy of Perching Manor and the farm and gradually returned the land to good heart. Thus, for example, his sons recalled having to remove couch grass from the upper parts of the Downs for many years. Henry became Chairman of the Parish Council, was instrumental in having the telephone service extended from Poynings to Fulking, and arranged for the Southdown bus service to be routed through the village. During the war he was the Home Guard sergeant for Fulking and later became officer in charge. In the early years, his 800 acre farm employed a workforce of 16 men and a dozen horses to tend 1000 Border Leicester sheep, 60 milking cows, a small herd of pigs and some 30 acres of arable land growing a mixed crop of wheat, flax, oats (for the horses) and barley (for the pigs). The remaining acreage was grazing pasture for cows and sheep, along with a market garden growing potatoes and onions. 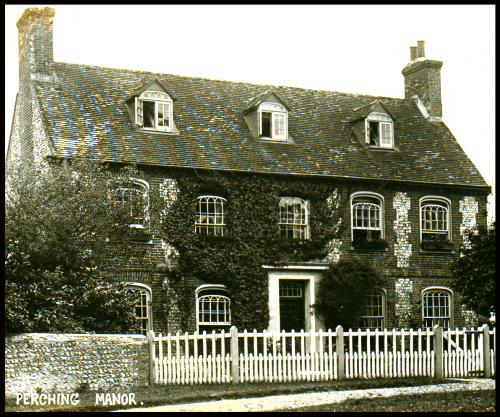 Perching Manor in the 1950s. Note the TV aerial. During the war, a team of land girls came in for the harvests and the male workforce included two German and three Italian PoWs, the latter being billeted in the cellar at Perching Manor. The PoWs were repatriated in 1947 and 1948 and replaced by two displaced persons from Latvia. From around 1938 on, the farm acquired tractors and these rapidly displaced the horses and halved the workforce. After the war, three combine harvesters were purchased. During the 1950s, the farm holdings expanded to more than 2000 acres including 1000 acres for grain, 1000 sheep, and 250 cows bred for beef. When Henry Harris died in 1961, aged 72, his sons initially continued to run the farm as tenants of the Crown before Brian Harris took sole charge. In 1984, the Crown broke up the estate. The farm was sold to the National Freight Corporation and Perching Manor itself, which had always been the main farmhouse and the home of the farmer, was sold as a separate lot to the Dubrey family. The house remains in private ownership. William Beard (1954) Glimpses of past personalities. 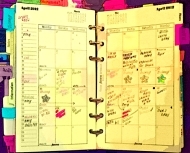 St. Andrews Quarterly 24. F.A. Howe (1958) A Chronicle of Edburton and Fulking in the County of Sussex. Crawley: Hubners Ltd.
Tony Wales (1999) The West Sussex Village Book. Newbury: Countryside Books. This entry was posted in Farming, Listed Building, Local History, Woodmancote. Bookmark the permalink.